You may not have given it much thought, but pizza and sports are a natural pairing. There are good reasons why people in Las Vegas love to have pizza delivered during a game. Here are a few of them. Tradition plays a part in many of our food habits. Somehow, tapping into them evokes pleasant memories that add to the fun of the moment. Certain foods are popularly associated with distinct holidays, routines or activities. Delivery of pizza to residents in Las Vegas increases at game time. Although pizzas are delivered during holidays, you will see a dramatic increase during sporting events, whether that is at home, a tailgate party, or even at a children’s party. There is a very practical reason why people eat pizza during a sports game, particularly at home. Games are usually watched in the living room on a widescreen television, so the food you are noshing on has to be relatively compact and easy to eat. The excitement increases at the sight of a goal, and that could be missed if you have to be careful about dropping food. Sports are a leisure activity, so enthusiasts may not want to cook that night. 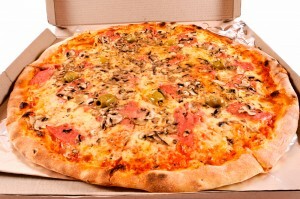 Instead, if you call for pizza delivery in 89101, residents can enjoy the game unhindered. A subconscious reason why pizza and sports make good companions is that the same chemical reactions occur in your brain when you eat pizza and when you watch sports. Endorphins, the feel-good chemicals in the brain, are pumped out when you do both. Order a mouth-watering pizza for your next game. It just makes sense.